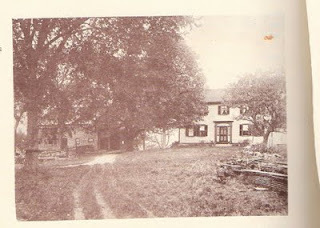 Continuing to teaching myself how to load pictures (a long slow process), while working on the 1795 House's entrance. the barn was still there, the driveway dirt. -not as tall and imposing. It has an elliptical fan, and columns, a roof. But the columns stop at the fan, and there is no broad architrave (the piece above the fan) below the entrance's roof. When I blew up the picture, it was clear the fan's curve ends with straight sides, maybe 3" high. The 'joiner' - the traditional name the millwork guy chooses to use for what he does -tells me this detail makes for an easier joint: square instead of at an angle. The other entrances in town of approximately the same date are both too grand to copy. The entrance we needed to recreate, as you can see in the photo, was lovely but less imposing. So, what size was it? And what shape was the fan?